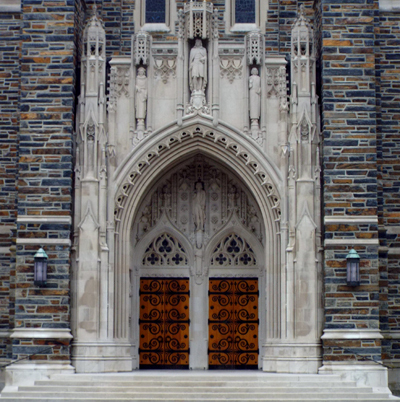 The entrance to Duke Chapel currently incorporates nine statues into the facade. Visitors walk in under Thomas Coke, Francis Asbury, and George Whitfield. The left side of the portal contains Girolamo Savonarola, Martin Luther, and John Wycliffe. Across from them, on the right, Thomas Jefferson stands next to Sidney Lanier. John Wesley, the founder of Methodism, is in the entrance to Duke Chapel and stands on the inner arch above the doors to the chapel. These life-size statues stand about three feet off the ground. The tenth statue dedicated to Robert E. Lee originally stood by Thomas Jefferson. On August 16, 2017, it was defaced and on August 19 it was removed from the entrance to Duke University Chapel. The monument was among several that was vandalized after the death of a counter-protester, Heather Heyer, at a white supremacist rally in Charlottesville, Virginia in August 2017 and after President Donald Trump expressed his opposition to the removal of Confederate memorials. 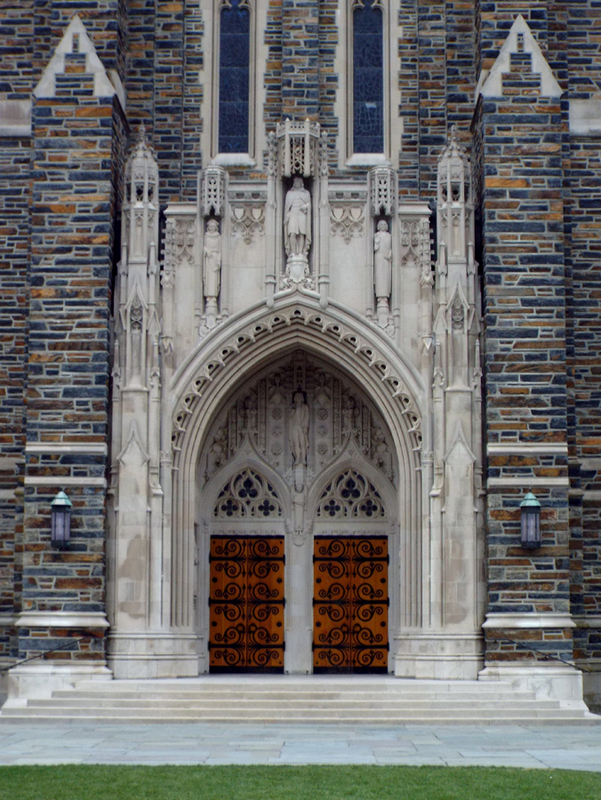 "DUKE UNIVERSITY DEDICATES CHAPEL: Dean Hough of Drew Seminary and Other Notables Are Among Speakers," New York Times (New York, NY), Jun 03, 13. Cheek, Richard. The Chapel, Duke University (Durham, N.C.: Duke University Stores, 1986). The construction of the entire chapel cost $2.3 million. The Chapel opened its doors for the university's commencement in 1932 and was officially dedicated June 2, 1935. The statues marking the entrance to Duke University Chapel are a mixture of important religious figures and individuals important to the culture of the American South. Wesley, Asbury, and Coke were all prominent figures in the Methodist Church and although non-denominational, Duke Chapel nevertheless displays heavy Methodist influences because the Duke family was Methodist. John Wesley, whose statue stands above the doors of the Chapel, was the founder of the Methodist Church. Whitefield was a member of the Anglican Church, but joined the Wesley brothers on their mission to Georgia. Savonarola, a Dominican friar in Renaissance Florence, and Wycliffe, an English theologian during the 14th century, spoke out against various aspects of the Catholic Church. Luther split from the Catholic Church to launch the Protestant Reformation. Alongside these religious figures stand figures significant to the history of the American South. Thomas Jefferson was a founder of the Democratic Party and the third president of the United States. Confederate General Robert E. Lee was held up by many white southerners as the epitome of a white southern gentleman. Lanier was the most distinguished southern poet of the nineteenth century and died in North Carolina. The Robert E. Lee statue incorporated into the facade of the chapel entrance was among several vandalized after the death of a counter-protester, Heather Heyer, at a white supremacist rally in Charlottesville, Virginia in August 2017 and after President Donald Trump expressed his opposition to the removal of Confederate memorials. On August 19, 2017, the statue was removed. The university President Vincent Price wrote the following in a letter to the campus community, "I took this course of action to protect Duke Chapel, to ensure the vital safety of students and community members who worship there, and above all to express the deep and abiding values of our university." He also said that the statue "will be preserved so that students can study Duke’s complex past and take part in a more inclusive future." The portal forms the entrance to the chapel, on the southeast face of the building. It faces Chapel Drive and a large, grassy quadrangle. To the north of the entrance (one's right as they enter the building), is located the Divinity School. In front of the chapel are three wide stone pathways—one passing in front of the chapel and two leading to the chapel. The areas between these pathways are grass-covered but otherwise unadorned.